A short drive from the Versilia epicenter of the fashionistas - Forte dei Marmi - there's a small resort community where vacationers stroll, children play, and rabbits loll. There are no paparazzi waiting for a starlet's 'mistake'. The prices will not steal your breath away, and you can park without an epic struggle. If you'd like a simple walk to enjoy the Italian seashore and see ordinary Italians relaxing, we invite you with us to explore Marina di Massa - and, by all means, bring the kids! First we describe a circular walk around the town, then below are the sections Getting There, Restaurants, and More Ideas. For orientation, see our Marina di Massa Map. The small center of Marina di Massa lies a few blocks inland from the shore highway. It's a business district with a grid street layout centered along Via San Leonardo, which is perpendicular to the shore. On the north side is a ZTL (Zone of Limited Traffic) during the summer and weekends, and the resulting pedestrian area makes for pleasant strolling and window shopping. On the south side is a large shady park with benches and a playground where you can relax and watch the kids play while you analyze their parents. There are numerous establishments which will tempt you with pizza slices, gelato, and piadine (a type of sandwich). Below, we mention two restaurants in the center. Walking toward the sea along Via San Leonardo leads to a wind rose (rosa dei venti) at the beginning of the pier. This is a star shape with a point for each direction of wind, with its name in Italian. 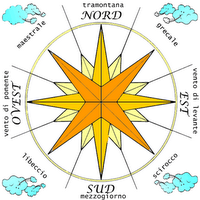 The wind rose preceded the now more familiar compass rose which shows the directions, N, NE, E, SE, etc. You probably already know that the Scirocco comes from the southeast and carries the dust of the Sahara directly to your car's windshield. Now you can study the rose and the nearby educational sign and learn that you dress warmly when you hear the word Maestrale, and postpone the boat trip upon hearing of a Libeccio. 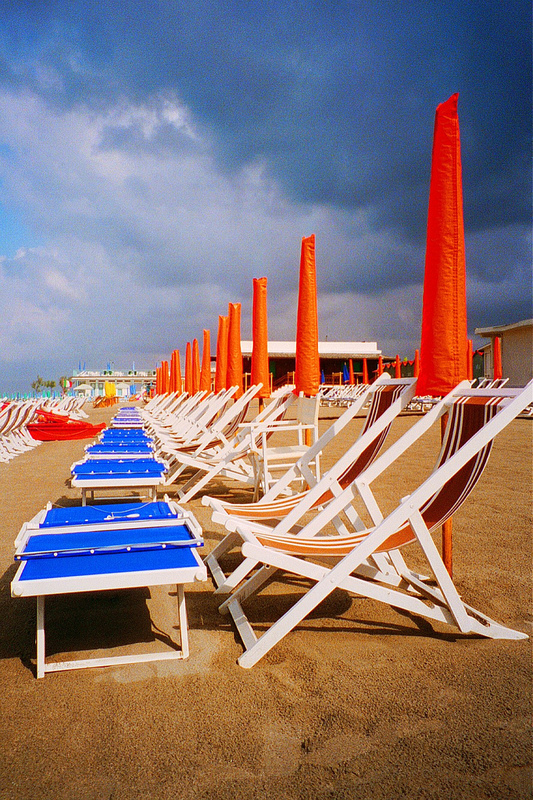 This is the highlight of Marina di Massa and naturally unites its attractions. It extends 700 feet into the sea and its length provides lovely views in good weather. To the north, across the water, is the distant Caprione Promontory (Montemarcello, Ameglia, Lerici) and the beach stretches off until the port facilities at Marina di Carrara. (We also have a walk description of Marina di Carrara, see the index). To the east rise the dramatic Apuan Alps with the gleaming white of the Carrara marble quarries. To the south the beach stretches as far as you can see, which is to Viareggio. It's easy to understand why this littoral zone is so desirable, and is probably Italy's most famous. There's much to watch on this long walkway into the sea: bathers and swimmers, fishermen and lovers, Italian tourists and tourists from God-knows-where. There are fishermen along the pier, usually toward the end. Many will be operating a net which they raise by means of a hand-cranked winch. This is called a 'bilance', since it resembles a scale. Fun to watch, but don't wait too long for the action, as in our dozens of trips here in all seasons, we have never seen a single fish caught. The pier is a wonderful place to be in a mareggiata (sea storm). The Mediterranean in this area has only about an 8 inch tide, and it is shallow. Thus when storm winds are onshore, long rows of giant waves will march to shore in dramatic effect. Several times we have seen - at a distance - the crests of waves sweep entirely over the end of the pier. Adjacent to the pier are the free beaches, and while they are crowded, they provide all the more theater for walkers on the pier. The number of umbrellas and reclining beach chairs receding into the distance seems like a good approximation of infinity to us. So renowned is this area that several of these bagni (beach clubs) are more than a century old! These include Bagno Sayonara, Il Rossi, and Bagno Giulia. The coastline is publicly owned in Italy, and the bagni operate under leases from the government. If this practice would result in periodic scandals and controversies in your country, then you can sympathize all the more with an Italian taxpayer. Unique to this part of the coast, called the Apuan Coast (Costa Apuana), are the breakwaters which extend out into the sea perpendicular to the beach. These were constructed to stop beach erosion, which became a major problem here after the construction of the Marina di Carrara port facility in the 1930's. This unforeseen side effect resulted in over 120 feet of the beach width being eroded away before the breakwaters were placed. Luckily it provides a perfect environment for small children to hunt for crabs and other monsters in the rocks. Leaving the pier, turn right and walk along the shore road. There are many stores featuring touristy stuff of every type, some of it even interesting. There are numerous restaurants - mostly featuring seafood, of course. We've eaten at several of these over the years, and, as a category, we felt they offered a decent quality at a price that's not unfair considering the location. When you reach a bridge, turn left and cross the road onto Via Lungofrigido di Ponente. This is along the Frigido river, which runs all the way to the mountains, and which - until a decade ago - ran white with marble dust during business hours. Walk along the river a 100 meters or so, and you'll reach a most curious attraction. This idiosyncratic park is open to the public, and there's no admission fee. It will delight your children, and leave you in wonderment that such a business can exist. There are free range rabbits, a sort of petting zoo, a bird exhibit, children's rides, and light refreshments. It is busiest in the late afternoon. In summer, it's open from 10am to 11pm daily, except from 1:30 pm on Monday. In winter, it's open daily from 1:30 to 7:00pm. When you leave, walk away from the river on the tree-shaded Via Mazzini, which leads back to the center of Marina di Massa. On the A12 Autostrada ( Genova-Livorno) take the Massa exit. After the toll, turn right, and then promptly right again at the traffic light (perhaps a roundabout by now) onto Via Enrico Mattei. Proceed straight about 1.5 km until the street ends at a roundabout, and you turn left. Drive less than a km and look for a parking space as soon as you cross a small canal. At busy times, you may wish to seek parking inland by turning left a block or two after you see the pier on your right. Bilal Doner Kabab Located in the center of town on Via San Leonardo, 509. Doner Kabab make a good picnic at only 4 Euro each, and they are similar to Gyros or Schwarma sandwiches. The meat is a tasty roast chicken-turkey combo. Choose a piadina (a wrap) or a pan arabo (pita pocket). Then choose your toppings as the sandwich is made. May we suggest 'con tutto' which will include a few french fries, yogurt sauce, tomato, pickles, onion, lettuce, and a spicy sauce. Be advised they can drip a bit as you head to the finish line. This popular, moderately priced restaurant offers a good value in the center of town on Via San Leonardo, 507. We like their antipasti and primi especially, and of course, they have nice seafood offerings. Closed Tuesday. Reserve in busy times. Tel. 0585-240278 . Marina di Massa's weekly market is on Friday - located inland in the center of town. It's not huge, but there's always something to see. Hypermarket. One of the largest stores in the area is nearby - Carrefour, and it is busy enough to serve as shopping and entertainment. It also offers lower priced petrol. Remember to adjust your idea of personal space before entering. From Marina di Massa head back toward the autostrada and watch for signs. When you reach the large intersection on Via Enrico Mattei and the autostrada sign suggests left, keep going straight for one long block. Turn right at the next light onto Via Dorsale, and then right into Carrefour. Cinquale Canal. About 2 miles south of the pier at Marina di Massa, along the shore road, is the Cinquale Canal. This was part of the Gothic Line in WWII. Here in February, 1945, the African-American 'Buffalo Soldiers' of the 92nd Infantry of the US Army tried to break through the Gothic Line for the first time and suffered 1100 casualties. Read about these real heroes in our story Liberation Day and The Liberation of America. For research purposes, Marina di Massa is a frazione of the city of Massa in the province of Massa-Cararra and should not be confused with Massa Marittima in the province of Grosseto. Lead photo by: Roby Ferrari.